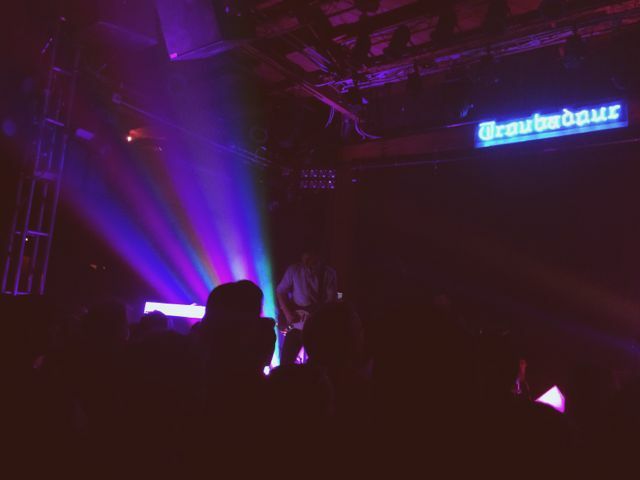 Generationals show last night, at Troubadour in WeHo. And that's not even touching the artist debuts (including Joni Mitchell, Neil Young, and James Taylor), discoveries of then-unknown talents, reunions and secret shows. Here's the whole jaw-dropping timeline, if you're interested. Big shoes to fill! This was the second time I'd seen Generationals, and I wasn't sure how much I'd like this show, as I'm not as crazy about their latest album. But yay! They played all my earlier favorites, totally rocking out at the ends. They even had a trio of trumpeters, which I don't remember them having at the 2012 show at The Echo (though I could have just missed it). Speaking of which, I'd like to put forth a proposal I'm calling the Initiative for Fair Appreciation of Music, or iFam. iFam asks live music attendees to abide by one simple rule, which is this: the more familiar you are with a performer's oeuvre, the closer you have a right to be. So if you're a die-hard fan who knows every word of every album, you my friend deserve a spot smack against the stage, and no one should begrudge you that (provided you don't shove up halfway though the show). Likewise, if you're new to the artist, maybe hang towards the back of the crowd, in fairness to more long-term fans? And the middle section should fill up accordingly. iFam: cooperation and mutual respect, amongst your brothers and sisters in music fandom. Terence and I sometimes do a thing at shows where, rather than shout in one another's ears, we pass my phone back and forth, using the notepad to communicate silently. (This is usually towards the end, and always with the brightness turned all the way down and the phone held low, away from people's faces.) 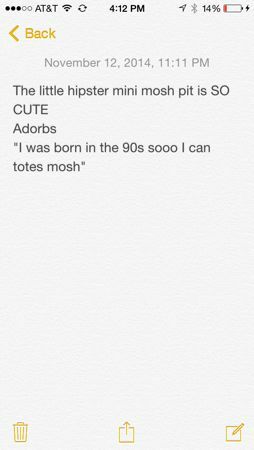 Some of these notes - specifically the ones at EDM shows - are hilarious, but I don't share them since they usually contain references to drugs. They really were adorbs, bumping around trying to make a mosh pit happen on Generationals' more banging tracks (4/10 on the banging scale, at best). Anyhoo, definitely check out Troubadour if you're local and you haven't been. 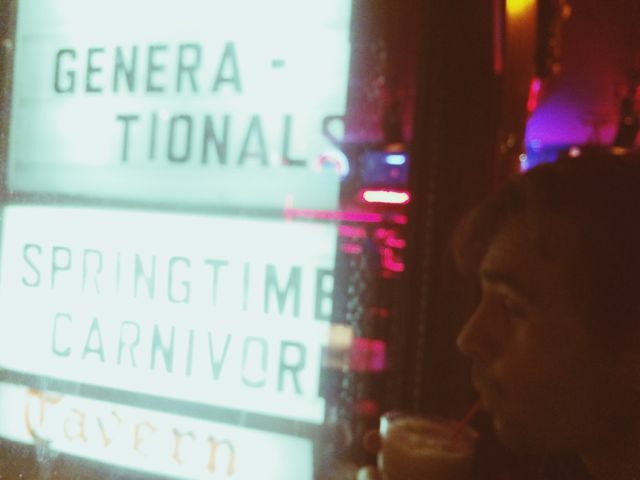 And if you're not local but you think you'd like it if Vampire Weekend recorded a falsetto-heavy album while on a Valium bender, check out Generationals.